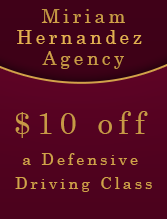 In the Hernandez Agency, we offer two options for defensive driving. Whether you want to receive a 10% reduction on your insurance or remove 4 points on your driving record, we have the defensive classes to take care of those issues. We do a monthly class where you must come into the office to SIGN UP.